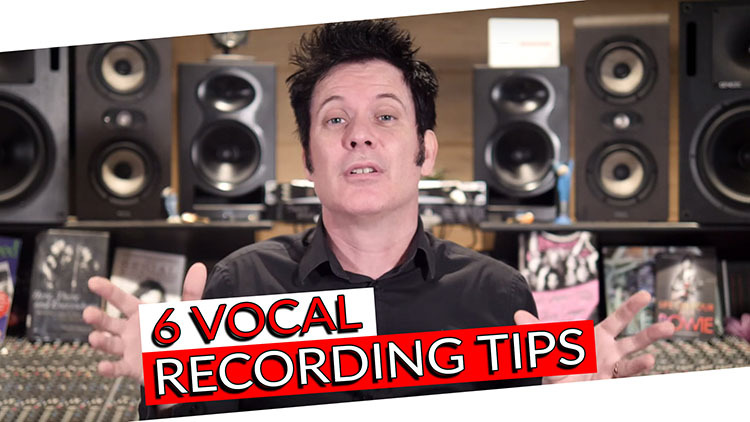 In today’s video we’re going to be talking about 6 ways to drastically improve your vocal recordings! I really love talking about vocal recording. Those of you who know any of the recordings I’ve done know I’ve been blessed to have worked with many great singers and if there is one thing I care about more than anything else when recording, it’s about capturing great vocals. I have many different techniques that I have discussed on the technical side and I will continue to let you know all the techniques I’ve used over the years. There are many basic techniques that if we follow we will get really really great results! Don’t get me wrong, I know not many of us have incredible mic lockers full of every single vintage microphone you could imagine! It seems to be only classic recording studios like Capitol, Abbey Road, Sunset Sound, East West, United… etc. have that kind of collection. However, having just a couple variations can make all of the difference. Having a mid-price condenser and a dynamic microphone already gives you an enormous range of options. You’ve heard me talk about the mic shootout we did in Nashville last summer- it was absolutely fantastic. We went from a priceless pristine U47 all the way down to the SM7 which, I’m sure you’ve heard was the mic of choice by Micheal Jackson on Thriller and everything in between. In a blind test the microphone that was in the top 3 most often was the SM7. The U47 was number one for most people and eventually in our point system was the popular choice. But the reality is the SM7 is a fairly inexpensive dynamic microphone, and the SM57 or anybody’s equivalent to that at about $100, gives you a very very different response. Some singers have very little high-mid articulation and a dynamic microphone has a bit of a presence lift giving you an immediate completely different response than a relatively flat condenser. If you’re blessed to have 3, 4, or 5 different mics, don’t be afraid to try them out. I recorded a great singer, Jamie Hartman, and he told me my U47 was going to sound awful on his vocals and I didn’t believe him. I thought “it’s a U47 it’s going to sound amazing on everything.” He was right, he actually sounded phenomenal on a 414 which is not an inexpensive mic but it’s like $1,200 vs. $15,000. There’s the reality, throwing money at a situation is not always going to solve it. A variation of microphones would. There is not a one size fits all in any situation. So experiment! The secret here is to listen to your sound source and make a decision based on that. This is really important and I’ve read lots of different and slightly confusing stuff on this. Coming up under guys like Dave Jergen and Jack Douglas, I learned from them that the best way to position a microphone is literally the capsule on the mouth. You can try off axis stuff and if you have a singer sing slightly to on side, that my work, but you are playing with fire because if they turn there head just a little bit you can lose all high-end articulation really easily. If you start with the singer right on the capsule, even if they move slightly your not going to have as many issues. Secondly, if you hear a little nasalness you’ll want to bring the capsule down a little lower. I’ve read as well that they were having the singer sing off axis to reduce plosives- there are many better ways to get rid of plosives. You can take your pop screen and put a pencil across it and just tape it there, that will divide the air instead of it going straight into it. Having said that, you’re never going to control everything about the singer. Cut yourself some slack because capturing a performance is better than not capturing it at all. Tip 3 Don’t Forget About the Proximity Effect. The Proximity Effect can be your friend, I read a lot about people saying to be about 18 inches away… that’s a long way away. That could be good for a rock singer; somebody that’s screaming like crazy and may cause the capsule to distort- You may need to pad the microphone in that instance. However, proximity can be amazing when you get right on the microphone. The extra warmth that the microphone is giving you can be phenomenal. You just need to understand proximity. I tend to have vocalist 8-10 inches away in general. I don’t personally believe there is a perfect anything. It’s all about understanding that microphones are like instruments; they are another tool in your arsenal. I have had a hand full of singers show up with their own pair of headphones and that can be phenomenal! It can save your life. They just plug it in and they know exactly how they are going to sound. And psychologically they feel comfortable and confident that the headphones are going to sound good because they are the headphones that they own. Now that could also be a little bit of a curse, because they may have open back headphones that are blending all over the place. They may have headphones that can’t take the level that they want. Sometimes headphones that sound good for listening to music, aren’t the best for monitoring. But uncompressed dynamic performances like their own vocals cannot work in those situations. So it can be a blessing and a curse, obviously always listen to your singer- if they come prepared with their headphones try them out, but make sure you have good headphones available. The two things I look for in vocal headphones are obviously sound and comfort all in one. Secondly, decent enough isolation is really important. If you have somebody whispering a verse, which happens, (I’m doing vocals at the moment where the singer is whispering and they have so much gain on their microphone and they like the vocals and music to be so loud we could be in all kinds of trouble), we could have tons and tons of bleed coming through, so good insulation is also a great thing to have. Good Insulation is very important. Sounding good is very very important. Comfort is also very very important. If you’re going to be doing vocals for huge amounts of time, having comfortable headphones is very very important. It doesn’t matter how good they sound, if they are clamping the side of your head, you’re not going to get a good vocal performance. All three of those things are important. The great thing is the good headphones that I use cost between $100-$300. When I’m working with Eric, I will ask him to listen to the Artist headphone mix. We have a headphone box which has 8 outputs; one for the artist, one for Eric and one for me, and then the others for anyone else we have here. This also lets us not have to monitor super loud. The thing about having those headphones is that we can hear what the artist is hearing, and that is really really important. I’ll also have Eric run in there and listen on playback to make sure they aren’t so unbelievably loud. If you’ve been tracking vocals for 3-4 hours the singer may have asked you to slowly turn up those vocals. These are the things that are super important. Make sure the mix is great and the volume is at a decent level. It’s better to have somebody to turn it up than to throw off the headphones because it’s been so unbelievably loud! I’ve had it happen to me. It was in 1999, I was working with the Bangles doing demos for them- we came to do an overdub (with Debbie the drummer) and I had not checked the headphone volume because it was a punch in from the night before, and she threw off the headphones. I remember being really embarrassed and full of anxiety. Luckily she is a great person and a great drummer and forgave me! It was super loud because she was doing a drum fill overdub the night before and she had been in the room with the full band with everyone tracking. The next morning she just wanted to do a fill overdub- her ears were fresh and I didn’t check the volume and she threw them off. When you have that happen to you, you will always make sure to have really good headphone mix for your artist. I personally never ever apply EQ to the vocal when recording. I always record flat. That is where a good microphone choice can really help you out. If you do happen to have two or more vocal microphones, you can try them out. If you want a little presence in it, try out the dynamic- if you want some more warmth and you have too much brightness and you happen to have a Ribbon, try that! All of these things are great tools for you, but ultimately I don’t like to apply EQ. I will on occasion high pass a vocal, especially in a situation where there’s some low rumble- I have no problem with taking 60HZ in the blowout. Sometimes we work in the most ideal situations, sometimes we’re working in beautiful studios, other times we’re in a hotel on a laptop. I will often EQ high pass on the way in, no always, but I will apply no other EQ. The reality is singers will ask for lost of reverb, delay or no reverb, no delay, or interesting effects to inspire them. It doesn’t mean that those are the effects that you’re going to have at the end. Some people want it really heavily compressed and want to feel every breath and everything- other people want zero compression. The singer we’re working with at the moment has an incredibly dynamic voice but he actually wants it printed like that because he wants to use his range (and he has a massive range.) Some singers are the other way around- they’re trying to hit a note loudly, but they aren’t capable of doing it so they will enjoy a little bit of compression. If you don’t specifically understand how you want the compression to be on the way in, then don’t print it with tons of compression. Maybe put a plugin on there so the singer can hear the compression. These are the kinds of things that you can’t undo- too much EQ and overly compressed vocals are very hard to undo. Don’t get me wrong I do compress on the way in, I love to commit, but I’ve been doing this a long time and I know exactly how I want to hear the vocal and I know how much gain I want to put on my mic pre to push it a little harder. If you’re having doubts in this area I think the vocal is the one thing that is okay to not put compression or EQ on the way in. The vocal for many people is the one thing they will notice and is the thing you should take the most care of. What I love about this discussion here is we’re in a place now where too much music is made in the box using virtual instruments, and the only thing that’s left to us that is always going to be organically recorded is the human voice. Until they put a chip into the side of a famous singers brain and are able to pull out his vocals and drop it in, there will always be vocals recorded.